Download and update the latest and official DXMJ1 Android 2.3.6 Gingerbread firmware on Samsung Galaxy Y GT-S5360 Smartphone. Samsung recently rolled out the firmware for several countries. Till now, the Galaxy Y S5360 received many regular firmware update by Samsung and there is no news about any Jelly Bean update for the device. If you not yet updated your device to this latest official firmware, then you can now update the DXMJ1 Android 2.3.6 Gingerbread using our simple tutorial below. You can check latest available firmware for your device through OTA (over the air) from Settings-About Phone-Software Update. If your Galaxy Y S5360 already running on Android 2.3.6 GB, you can only expect few bug fixes and performance enhancement with this latest firmware update. It is always recommended to update your device to the latest available firmware. So, want to update your Galaxy Y S5360 to the latest DXMJ1 Android 2.3.6 Gingerbread firmware? For official process, either you can go for OTA update by following the above mentioned path or download and update firmware through the Samsung Kies utility. However, most of us prefer manual way to update official firmware. So, in this article you’ll find step by step manual guide to update the latest Android 2.3.6 DXMJ1 firmware on your Galaxy Y S5360 through Odin. "The firmware is released only for the Samsung Galaxy Y GT-S5360 model, so don’t try this in any other android device. Check your device model number from Settings-About Phone. Also the tutorial is based on Windows PC. Follow all the pre-requisites, procedures and steps carefully to avoid breaking your phone". Samsung rolled out the firmware for the following countries. 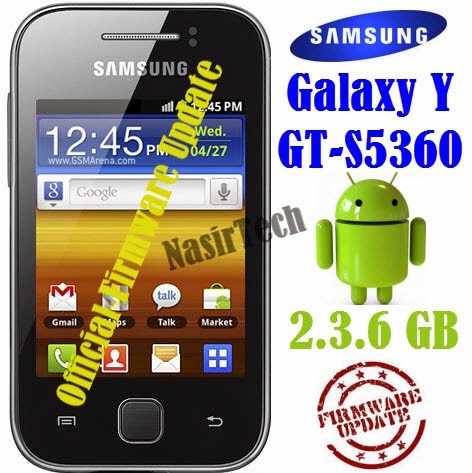 The firmware which are unbranded or not locked to any carrier, no matter of which country or region, can be flashed on any Galaxy Y GT-S5360 model. All the above pre-requisites are very important and must follow before proceed to installation guide. Hope you get all the above points. Now, go through the below tutorial to install Android 2.3.6 S5360DXMJ1 official firmware on Galaxy Y S5360. Switch off your phone and boot Galaxy Y S5360 into Download Mode by pressing and holding the Volume Down+Home+Power buttons (long press until the boot screen appear), now press Volume Up key to proceed to Download Mode. Congratulations, your Galaxy Y S5360 is now updated to the latest and official DXMJ1 Android 2.3.6 Gingerbread firmware. Hope you successfully completed the update process. If you followed everything as mentioned in the above above tutorial, then your your Galaxy Y should now running on the latest Android 2.3.6 Gingerbread build version DXMJ1. You can confirm the firmware update from Settings-About Phone. So, explore the latest update on your device and share your experience with us and also let us know how you find the above tutorial using the comment section below. Please update your links. Hotfile was closed by United States Federal Court. Loop boot :( How can I fix it, i already dd the recovery mode options. But still it's just showing the samsung galaxy y logo :( Please help me. ano gamit mo sir Cavidan Amiraliev? May be your Phone drivers are not installed in your system.. this is the only reason for this kind of problems or your USB cable is damaged. why is it the ending remarks is RESET! Please sir tell me a firmware which is working in Pakistan. waiting for your positive replies.